Recommended for parents of Suzuki Method(R) students, this sequel to Nurtured by Love features a quote by Dr. Suzuki that states "the fate of the child is in the hands of his parents." With this book he shows how to create a warm environment which will encourage any child to become a happy, loving, and talented human being. Start reading Ability Development from Age Zero on your Kindle in under a minute. This is a must for any parent starting a child in the Suzuki method. Excellent explanations for parents who may have learned by traditional methods when they were children. Dr. Suzuki's approach is different. His approach is that a child can learn to play a musical instrument like the child learns to speak the native language: by repetition, encouragement from the parent with the parent being the "home teacher" and doing what the teacher has done in lessons. Therefore, the child begins by learning the music by rote memorization in the first book ....I call it "copy cat" and we make a game of that learning. Memory is developed and serves the child well as he/she ages in school and into the adult world. Hand position, sound production are also developed. This book prepares the parent to expect to wait to learn to read notes/rhythms/ etc. as in traditional methods until later in the lessons. Reading comes, but it is delayed until the basic touches, memory, etc. are developed. has lots of good ideas, not always practical to apply in the real world. Author repeated himself a lot in the last 1/4 of the book. overall pretty good to read once and get some more views on parenting that you may not completely agree with. 3.0 out of 5 starsInspirational, although weaker than "Nurtured by Love"
This book is similar in message to Suzuki's earlier book, "Nurtured by love". 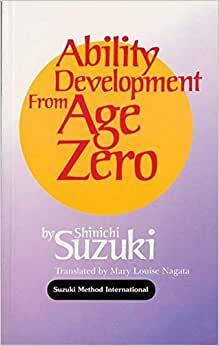 Suzuki-humanist and philosopher is more evident here than in that other book. Praise from the parent, developing child's concentration and setting fun tasks that can be accomplished are some of advises on rearing children. Suzuki strongly believes that the real education is at home and therefore advocates for parents' self-reflecting: you reap what you saw, therefore you should strive to be a fine person yourself to raise fine children. As in "Nurtured by love", some of the life philosophy sounds a bit out of place: "act quickly on what you think", while an excellent advice, should have been tied in with the rest of the book. The same goes for other maxims, such as "do not cheat yourself". Both "Nurtured by Love" and "Ability Development" suffer from the lack of directed studies and critical analysis of much that Suzuki postulates. Intuitively though, his theories sound very appealing, while the great optimism and love for children shine through the imperfections of the books. The book reads like a somewhat watered-down version of "Nurtured by Love", which I would recommend instead of this one. The book is good, however, as I read the pages fall out! This shouldn't happen to a new book, and it is then just frustrating to read. I wouldn't recommend buying this book unless having the book fall apart as you read doesn't bother you. I always thought "Suzuki Method" was merely for music students. This is a fantastic parenting book. I am sure I will read it over and over as my children grow. The anecdotal voice of the book makes it a breeze to get through, and a pleasure. The only book I think even more highly of is "Nurtured by Love", the second book I read by Suzuki. The information is so basic and obvious, yet completely transcendental. He is a beautiful, clear writer, and has amassed a huge following for a reason. Beautiful person, beautiful books.